Computers now form an integral part of most real-time control systems. With the advent of the microprocessors and microcontrollers in the last few decades the use of computers in control applications has been ever growing. Microcontrollers are single-chip computers which can be used to control real-time systems. Such controllers are also referred to as embedded real-time computers. These devices are low-cost, single-chip and easy to program. Microcontrollers have traditionally been programmed using the assembly language of the target processor. 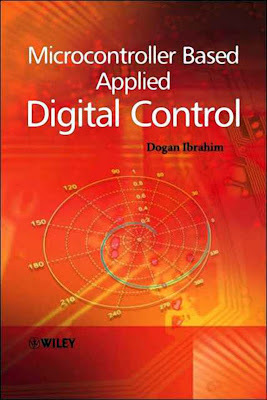 It is now possible to program these devices using high-level languages such as BASIC, PASCAL, or C.
This book is about the theory and practice of microcontroller based automatic control systems engineering. A previous knowledge of microcontroller hardware or software is not required, but the reader will find it useful to have some knowledge of a computer programming language. Las computadoras ahora forman parte integrante de la mayoría de los sistemas de control en tiempo real. Con la llegada de los microprocesadores y microcontroladores en las últimas décadas, el uso de las computadoras en las aplicaciones de control ha sido cada vez mayor. Los microcontroladores son ordenadores de un solo chip que se pueden utilizar para controlar sistemas en tiempo real. Tales controladores se denominan también como ordenadores embebidos en tiempo real. Estos dispositivos son de bajo costo, de un solo chip y fácil de programar. Los microcontroladores tradicionalmente se han programado utilizando el lenguaje ensamblador del procesador de destino. Ahora es posible programar estos dispositivos utilizando lenguajes de alto nivel como BASIC, PASCAL, o C.
Este libro trata sobre la teoría y la práctica del microcontrolador basado en el control automático de ingeniería de sistemas. El conocimiento previo de hardware o software del microcontrolador no es necesario, pero el lector encontrará que es útil tener algún conocimiento de un lenguaje de programación. Programming PIC Microcontrollers in C.
Sampled Data Systems and the z-Transform. Liquid Level Digital Control System: a Case Study. Introduction. The Idea of System Control. Computer in the Loop. Centralized and Distributed Control Systems. Scada Systems. Hardware Requirements for Computer Control. General Purpose Computers. Microcontrollers. Software Requirements for Computer Control. Polling. Using External Interrupts for Timing. Using Timer Interrupts. Ballast Coding. Using an External Real-Time Clock. Sensors Used in Computer Control. Temperature Sensors. Position Sensors. Velocity and Acceleration Sensors. Force Sensors. Pressure Sensors. Liquid Sensors. Air Flow Sensors. System Modelling. Mechanical Systems. Translational Mechanical Systems. Rotational Mechanical Systems. Electrical Systems. Electromechanical Systems. Fluid Systems. Hydraulic Systems. Thermal Systems. The PIC Microcontroller. The PIC Microcontroller Family. The 10FXXX Family. The 12CXXX/PIC12FXXX Family. The 16C5X Family. The 16CXXX Family. The 17CXXX Family. The PIC18CXXX Family. Minimum PIC Configuration. External Oscillator. Crystal Operation. Resonator Operation. RC Operation. Internal Clock. Some Popular PIC Microcontrollers. PIC16F84 Microcontroller. PIC16F877 Microcontroller. Programming PIC Microcontrollers in C. PICC Lite Variable Types. Bit. Unsigned Char. Signed Char. Unsigned Int. Signed Int. Long. Unsigned Long. Float. Double. Variables. Comments in Programs. Storing Variables in the Program Memory. Static Variables. Volatile Variables. Persistent Variables. Absolute Address Variables. Bank1 Qualifier. Arrays. ASCII Constants. Arithmetic and Logic Operators. Number Bases. Structures. Program Flow Control. If–Else Statement. Switch–Case Statement. For Statement. While Statement. Do Statement. Break Statement. Continue Statement. Functions in C. User Functions. Built-in Functions. Pointers in C. Pre-processor Commands. #define. #include. #asm and #endasm. Accessing the EEPROM Memory. Interupts in C Programs. Delays in C Programs. Structure of a C Program. PIC Microcontroller Input–Output Interface. Connecting an LED. Connecting a Push-Button Switch. Connecting an LCD. Microcontroller Project Development. Hardware and Software Requirements. Program Development Tools. Flow Charts. Structure Charts. Pseudocode. Exercise. Sampled Data Systems and the z-Transform. The Sampling Process. The z-Transform. Unit Step Function. Unit Ramp Function. Exponential Function. General Exponential Function. Sine Function. Cosine Function. Discrete Impulse Function. Delayed Discrete Impulse Function. Tables of z-Transforms. The z-Transform of a Function Expressed as a Laplace Transform. Properties of z-Transforms. Inverse z-Transforms. Pulse Transfer Function and Manipulation of Block Diagrams. Open-Loop Systems. Open-Loop Time Response. Closed-Loop Systems. Closed-Loop Time Response. System Time Response Characteristics. Time Response Comparison. Time Domain Specifications. Mapping the s-Plane into the z-Plane. Damping Ratio and Undamped Natural Frequency in the z-Plane. Damping Ratio. Undamped Natural Frequency. Damping Ratio and Undamped Natural Frequency Using Formulae. System Stability. Factorizing the Characteristic Equation. Jury’s Stability Test. Routh–Hurwitz Criterion. Root Locus. Nyquist Criterion. Bode Diagrams. Discrete Controller Design. Digital Controllers. Dead-Beat Controller. Dahlin Controller. Pole-Placement Control – Analytical. Pole-Placement Control – Graphical. PID Controller. Saturation and Integral Wind-Up. Derivative Kick. PID Tuning. Controller Realization. Direct Structure. Direct Canonical Structure. Direct Noncanonical Structure. Cascade Realization. Parallel Realization. PID Controller Implementations. Microcontroller Implementations. Implementing Second-Order Modules. Implementing First-Order Modules. Implementing Higher-Order Modules. Choice of Sampling Interval. Liquid Level Digital Control System: a Case Study. The System Schematic. System Model. Identification of the System. Designing a Controller. Conclusions. Appendix: Table of z-Transforms. MATLAB Tutorial.